Whilst showing my semaphore work as posters recently a member of the public approached me and asked if they were advertising aerobics classes. This sparked an idea. I have felt very drawn to the physical elements of the semaphore, as well as the performance of it. Meeting people and choreographing their movements, controlling them in some way, perhaps reflecting again the power I feel there lies in being an interpreter. I want to explore this further by using an upcoming exhibition to create a group performance/action of semaphore poses. Following me, the group (volunteers? Paid participants? 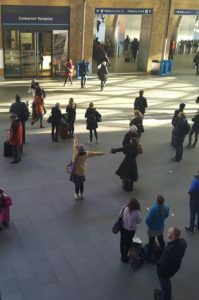 Or audience members/passers by) will copy a series of semaphore poses in a public space. Initially I was considering kings cross station as the place for this, and I tested this with two volunteers (see photos). However as kings cross is currently on high alert this may not be the best location. During the exhibition I will also encourage people to make some semaphore poses in the space. There is a mirrored corner where I will place flags and the code and encourage some participation. Today I’m reading ‘Inside the White cube’. My interest in being outside of the gallery space has led me to this with an acknowledgment that to understand why I want to be out of it, I also need to understand where it came from. Understanding the modern gallery space as we know it is essential to me and the context that this space itself holds and places on and within the art and those who use it. I feel very strongly that it is a ‘class’ issue when I feel I want to step out of the gallery with my work. But it is also precisely this that also wants me to engage with it too. The ‘gallery’ is seen as a place of posterity, a quiet almost spiritual place. A place of reverent silence, hushed whispers and solemn contemplation. Like a child I get fidgety and want to misbehave in such places, and I also ant to challenge these assumptions. Because these contexts, these ‘norms’ of behaviour within this space perhaps place a false context around the work (unless it is made specifically with the gallery in mind, or made within the gallery). So either the work created with a different must be placed elsewhere, or this change in context must be acknowledged or become a part of the work. For many artists, by placing their work within the gallery, brings it to life, gives it the status of art, or changes the status of the gallery.